The Program is jointly organized by the World Intellectual Property Organization (WIPO), the African Regional Intellectual Property Organization (ARIPO) and Africa University (AU) with financial support from the Government of Japan. The Program is held at AU in Mutare and at ARIPO in Harare. The MIP programme is designed mainly for people already in employment and who wish to receive training in intellectual property management, or advance their training in the case of those who already have some training in this field. The overall aim of the programme is to assist practitioners acquire appropriate knowledge and skills in the management of intellectual property systems. Develop professionals with competent research skills and capacity to design and deliver training programmes in one or more areas in the field of intellectual property. 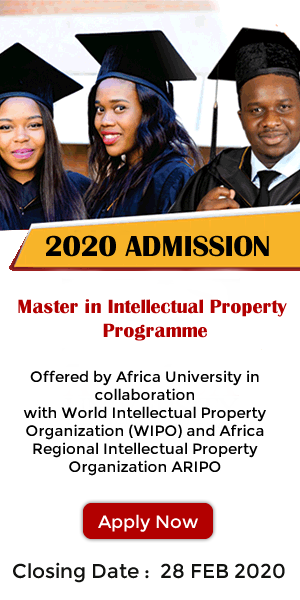 Upon satisfactory completion of the program, participants will be awarded a Masters Degree in Intellectual Property (MIP) by Africa University on behalf of WIPO and ARIPO. For tuition, registration and accommodation fees please follow link (subject to annual review). Cost of meals and upkeep is estimated at US$350.00 per month per person. Please note that uploading the following documents is mandatory and crucial for your MIP application to be considered. and at least two letters of reference. The application and its attachments should be received by Africa University no later than February 28, 2019. Applicants wishing to be considered for the various scholarships should specifically indicate so in their application, and ensure that they apply online at the WIPO website. Applications are invited from suitably qualified candidates for admission into the Masters in Intellectual Property (MIP) Program. The Degree is jointly offered by the World Intellectual Property Organization (WIPO) Academy, the African Regional Intellectual Property Organization (ARIPO) and Africa University (AU), with financial support from the Government of Japan. Second Part (August 1 to December 6, 2019): Residential phase requiring physical attendance at lectures undertaken at Africa University in Mutare (Zimbabwe) and practical training sessions at ARIPO in Harare. Third Part (December 09, 2019 to April 30, 2020): Dissertation Phase requiring research and writing on an approved topic. The Program adopts a comparative approach, with particular emphasis on Africa. Lectures are given by leading academics, intellectual property practitioners, intellectual property officers and other experts drawn from across Africa.